Nobody wants to file for bankruptcy. However, circumstances can spiral out of control and you can find yourself without any choice. You were laid off from work or had unexpected medical bills. You had to make a choice between paying the monthly credit card bills or putting food on the table. The choice is easy. When you realize that you can’t keep up with your credit card payments, you consult with your bankruptcy attorney. Most clients don’t know that unpaid income taxes can be discharged if certain requirements are met. It’s common that clients don’t list or bring up old income taxes owed as a debt, because they mistakenly believe that income taxes can never be discharged in bankruptcy. Many clients voluntarily pay the IRS under an agreed monthly payment plan which is a drain on their monthly budget. It can be very expensive to pay back owed income taxes to the IRS, because the government charges penalties and interest on the amount owed. When our firm’s attorney meets a new client, they always ask if income taxes are owed. If a client qualifies, then we tell them that they can stop paying the IRS. They often cannot believe the news! How much penalties and interest do you have to pay on owed income taxes? Before we explain the law’s requirements to discharge income taxes, you should understand how the IRS calculates the amount of penalties and interest that is owed when income taxes are not paid on time. When you do not file and do not pay your income taxes on time, you will not only owe interest on any unpaid balance, but you may also owe penalties. How much interest will I owe if I don’t file my income tax return on time? Interest is charged on any unpaid tax and the interest compounds daily from the due date of the tax return, without regard to any extension of time to file, until the date that you pay the tax in full. The current interest rate as of August, 2016 is 3.56%. This rate is determined every three months. How much penalties will I owe? If you have not paid your taxes on time, you will be charged a late payment penalty, in addition to the interest owed, which the IRS calls a “Failure to Pay Penalty”. The late payment penalty is 0.5% of the tax owed for each month or part of a month that the tax remains unpaid after the due date, up to 25%. You will not have to pay the penalty if you can show reasonable cause for the failure to pay the tax on time. The 0.5% rate increases to 1% per month if the tax remains unpaid after several notices from the IRS and 10 days after the IRS issues a final notice of intent to levy or seize property. If your return was filed timely and you are paying your tax via an installment agreement, the penalty is .25% for each month or part of a month that the installment agreement is in effect. Unfortunately, if you did not file your return on time and owe taxes, you may owe an additional penalty for “Failure to file on time” unless reasonable cause can be shown as to why you did not file on time. The penalty for failing to file on time is 5% for each month that your return was late up to 25%. Now it gets even worse: if you have not paid for five months, the failure to file penalty and the 0.5% failure to pay penalty continues until the tax is paid, up to 25%. The total penalty for failure to file and pay can be $47.5% of the tax owed. If the return is filed more than 60 days from the due date, the minimum failure to file penalty is the smaller of $205 or 100% of the tax required to be shown on the return. The amount of penalties and interest on taxes owed and late filing can be onerous. However, all taxes, interest and penalties owed at the time of filing a Chapter 7 bankruptcy petition can be discharged if certain requirements are met. If you qualify, a significant burden can be lifted from your financial shoulders. The 3 year rule: When did the taxes become due? The first question to ask is “When were the taxes due that were not paid?” If they became due at least three years before the bankruptcy case is filed, you have satisfied the “3 Year Rule”. Generally, the date that taxes are “due” is April 15th of the year next succeeding the year that the income was earned. For example, taxes are due for income earned in 2015 on April 15, 2016. 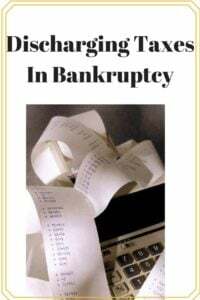 A bankruptcy case to discharge those taxes owed, can be filed on or after April 15, 2019, three years after the date that the taxes became due. In the event you obtain an extension of time to file your tax return, then the 3 year period begins from the date that the taxes are due under the extension. Even if you file your tax return late, you still have the right to include those taxes in your bankruptcy case if it is at least two years since the date that you filed the return. There is another rule that you must comply with even if you pass the 3 year rule and the 2 year rule: This is called the “240 day rule”. This rule states that the client’s taxes must have been assessed by the taxing agency at least 240 days before the bankruptcy case is filed in order for the owed taxes to be discharged in bankruptcy. Example: Client’s 2015 federal income taxes are due April 15, 2016. Client can file for bankruptcy on April 15, 2019 or thereafter and discharge those taxes. (April 15, 2016 plus 3 years) If client received an extension of time from the IRS to file their 2015 income tax return, then the 3 year period runs from the date that the taxes are due under the extension. For example, if client receives a 6 month extension from the IRS to file his 2015 income tax return, then client must file his bankruptcy petition on October 15, 2019. Example: Client’s 2015 federal income taxes are due April 15, 2016. Client forgets to file his return until July 1, 2017. If client wants a discharge for his 2015 taxes, client must wait at least until July 1, 2019 to file bankruptcy, 2 years from the date the return was filed and more than 3 years from the date the taxes were due. Client’s 2015 federal income tax return is filed on April 15, 2017. Taxes are due April 15, 2016 and assessed on April 15, 2017 by the IRS. Client meets the time requirements of the 3-2-240 rules on April 15, 2019. How do I find out the 3-2-240 rules’ dates? It’s not too hard to calculate the required dates. What you need to obtain from the IRS is an “account transcript” for each year that taxes are owed. The account transcript will show the due date, filing date and assessment date. You can order the account transcript online at http://www.irs.gov/Individuals/Order-a-Transcript, or calling the IRS at 800-908-9946, or by using an IRS form, IRS Form 4506T.